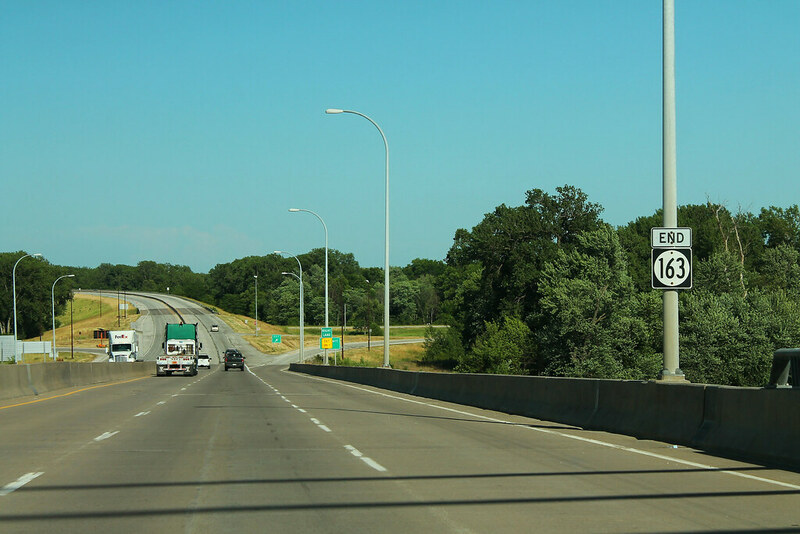 Personally, my choice would be a sign assembly with the new state's route shield -- regardless of whether the number continues or not -- appended to the "entering (state X)" sign, with a forward (up-arrow) indicator below the sign. Gets the entire job done with one sign assembly! For example, I looked where TX 207 ends at the OK panhandle border. You get a South TX 207 assembly and a county line sign, followed by the old Texas stone state-shape monument sign, then the "Welcome to Texas" BGS. Nothing else. Nothing on the OK side, since the part of the road there is a county road. We use to have a three state continuation with Indiana and Ohio. IN-120, M-120 and OH-120, both Indiana and Ohio still have theirs in the same place but Michigan went and put M-120 on another highway in a different part of the state. In between Indiana and Ohio it's a county road in Michigan. 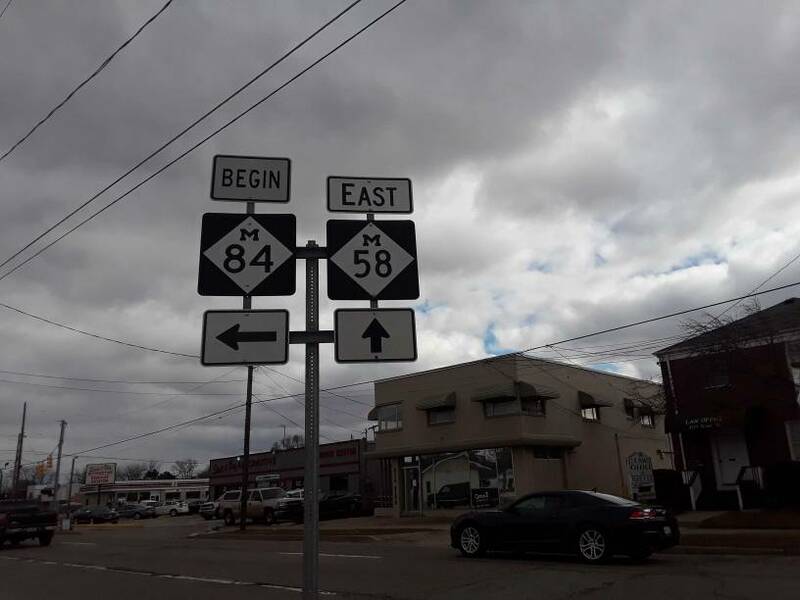 This obviously isn't anywhere near a state line but in my city (Saginaw) M-84 ends at M-58 and M-58 is a one way street and in both directions before the junction they have a BEGIN sign above the M-84 sign and an arrow pointing to the north. I don't think I ever noticed that anywhere else. I guess I can see why they would have an END sign at the state line though if that's where that route ends at. I would put it on the next state to sign it properly past that point. This is the sign I'm talking about which I think is a rare occurrence in Michigan. The Maine Turnpike has a set of END and BEGIN signs at the north end of the Piscataqua River Bridge along I-95 in Kittery. You'll also find a similar set of assemblies at the north end of the Turnpike in Augusta. GA 35 ends at the Florida line on its concurrency with US 319 between Thomasville and Tallahassee, and there at least used to be an END 35 sign at the border. Well I didn't find an End/Begin sign, but instead one that simply says the highway's cardinal direction at the state line, so it kinda counts? The streetview is also 12 years old (the oldest year I've seen still in use). GA has one for GA 520 at the AL State Line along US 280 and two for both GA 3 and 300 on US 19 at the FL State Line. I had photos submitted to Geoff Hatchard when he had his site for GA ends when him and JT Legg had one also. He featured all of mine that I gave him and some Trent took as well. Have to check my boxes as I just moved and still have not gone through my pics of old before digital. The streetview is also 12 years old (the oldest year I've seen still in use). Well, it would be tough to find older GSV still in use, considering it was launched 12 years ago. Usually the oldest I've seen that's the only one available is from 2009, so I thought it was cool. The only instance I've ever seen is that there is an "END 2" assembly where MO-2 becomes K-68 east of Louisburg. I didn't remember a corresponding sign for K-68 at the time I drove past there but Google maps show there is a "68 END" assembly on the Kansas side. I've also been at the north end of K-7 as it becomes a Nebraska county road but don't remember seeing an "END 7" assembly. There is a matching one at the other end of the Parkway (as well as an actual END sign), but it's not at a state line. 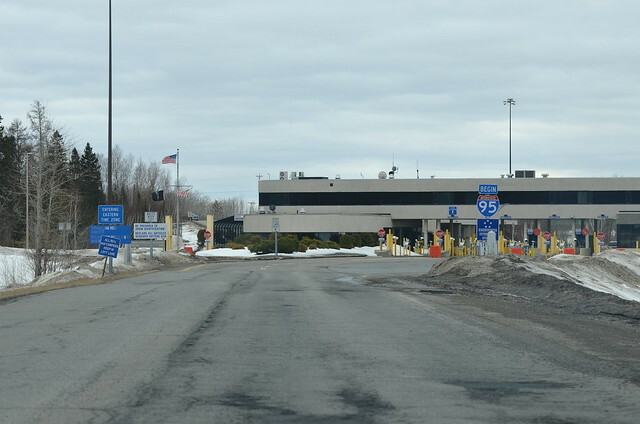 Fuzzy I-95 end at Canadian border. I live within 5 miles of IL 131/WI 31 and IL 173/WI 32. At least in Kenosha County, it looks like there are no "end" signs on any state highways on the Wisconsin side (31, 32, or 83). And when you are on WI 32 going south into Illinois, not only is there no end WI 32 sign on the Wisconsin side but I don't think there is a sign that tells you that you are on IL 137 until you get to the intersection with IL 173 which is almost 2.5 miles away. Also, Highway 83 keeps the same number in Illinois and Wisconsin and there is an "end IL 83" sign but you probably have to drive for at least a mile to see a WI 83 sign. And there is no "end WI 83" sign but there is an IL 83 sign right at the state line below the Illinois State Line/Lake County sign. Maryland SHA is already very inconsistent with END signs on state highways, and is even more inconsistent when those highways end at state lines. I haven’t seen any yet and I’m not sure where any might exist.